When can vehicles load-in? Main car show load-in is Friday, 5th from 9 a.m. to 8 pm. There is trailer and camper parking onsite. Overnight stays are allowed; however, there are no hookup services. Staff will be onsite to guide you upon arrival. When can vehicles leave? Vehicles can leave the grounds after 8 p.m. on Saturday or after 6 p.m. on Sunday. It is a 2 day show, with judging and events on both days. You may leave your vehicle in the trailer onsite, covered on the track or bring it home Saturday night and return at 7 a.m. on Sunday morning. Any specific questions: email brad@live-wire-media.com. We will provide onsite security both Friday and Saturday nights. What is the preferred show hotel? Our preferred hotel is the Marriott Courtyard. 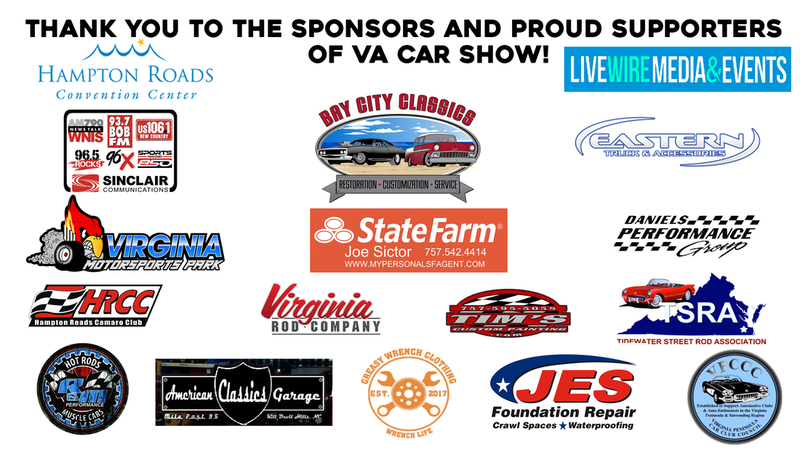 Call 757-838-3300 and ask for the VA CAR SHOW rate. It is located at 1917 Coliseum Drive, Hampton, VA. Any questions, call the hotel and ask for Dee. When can we pick up our information packets and passes? You may pick up your registration packet and event info Fri Jan 5th or Sat Jan 6th.